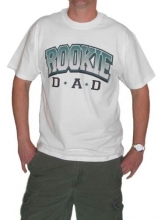 Rookie Dad T-Shirt Discounts Apply ! The first season is always tough. You've got to learn the ropes and figure out how to play the game like the veterans. This shirt is part of a winning uniform...it is machine washable!